Tennessee Williams’ birthplace of Columbus, Mississippi. We arrived at Deerlick Creek on Holt Lake on the Black Warrior-Tombigbee Waterway in the rolling hills northeast of Tuscaloosa, Alabama. 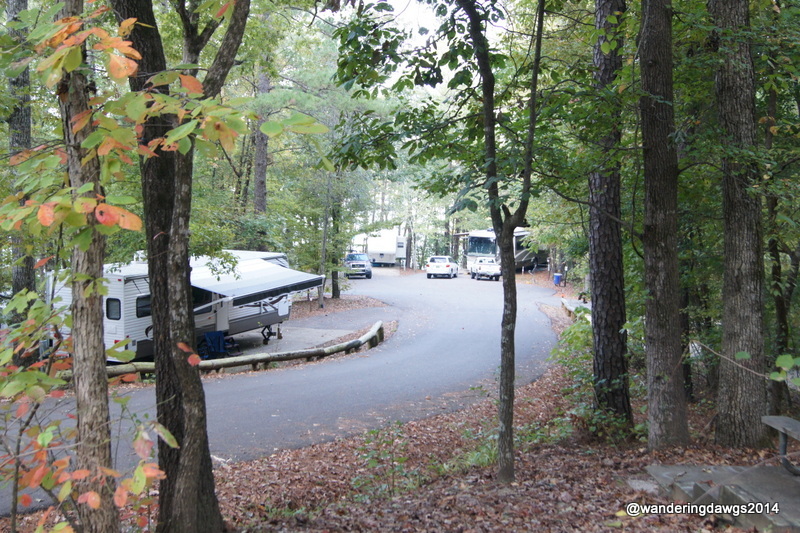 Behind our RV were a few steps up to a patio area with fire ring and picnic table. With trees all around we felt like the only campers there. Our two nights there were quiet and peaceful. Our site 28 was on a hill in the RBLU loop. We enjoyed this park but I would not recommend staying in this loop with a big rig. Getting out of the loop was a challenge. We drove down the hill, made a sharp left turn to continue down the hill, and turned around in a very tight turnaround to go back up the hill to exit the park. We had an audience watching but I never doubted Henry’s towing skills! Our second Alabama COE park was Gunter Hill on R. E. Bob Woodruff Lake in Montgomery, Alabama. I really felt at home when I saw Spanish Moss on the trees. We were in site 99 in the older section of the campground in a beautiful lake front site. There is a newer section which has been renovated with paved sites and full hookups. When we arrived the Saturday before Halloween we discovered the park was full for their traditional Halloween Trick-or-Treat. Families reserve their site six months in advance for this popular event. Elaborate Halloween decorations were seen throughout the park. I love it when we stumble upon an unexpected event! It was a great place to end our fall trip.